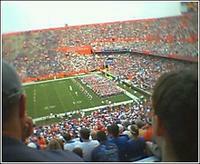 The Florida Gators have their second football game tomorrow night against Louisiana Tech. The Urban Meyer era got off to a good start last week. Hopefully, they will build on last week's performance and improve some. Next week comes the real challenge with Tennessee coming to town. That will be a game worth watching. The game that I believe will be worth watching will be November 26 when we see what the legend is made of. You are right. That game will be worth watching and will reveal how good the team is. First, though their are several other challenges. For example, this Saturday night against Tennessee.